The Domaine Grand Guilhem is an organic wine producing property of 12 hectares with a large 19th century house and outbuildings. It lies just above the minute wine producing village of Cascastel which is situated in the Fitou area of Southern France. This is in the region known popularly as Cathar country. It is 25 kilometres from the Mediterranean and the beaches, 30 kilometres south of Narbonne, 40 kilometres north of Perpignan and 40 kilometres south east of Carcassonne. The nearest town with facilities is Durban des Corbières, 6 kilometres from Cascastel, on the D611. 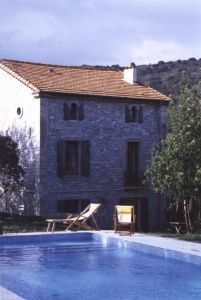 The main house – “Family mansion” – is built of local stone and its green shutters open onto a typical Mediterranean view with the Roman tiled roofs of Cascastel, the Garrigue and the vineyards which are planted with 60 year old Carignan, Grenache, Syrah, Mourvèdre, Muscat and Maccabeau varieties of vine plants. The architecture is of a Languedocian Vigneron’s house of the period but with some special details – the arched windows, ironwork balconies, originally from the Château of Cascastel, and stained glass windows – which give a unique flavour to the building. The rooms are spacious, the tiled floors and mosaics are original, the walls are ochre and together give a warm and welcoming atmosphere. 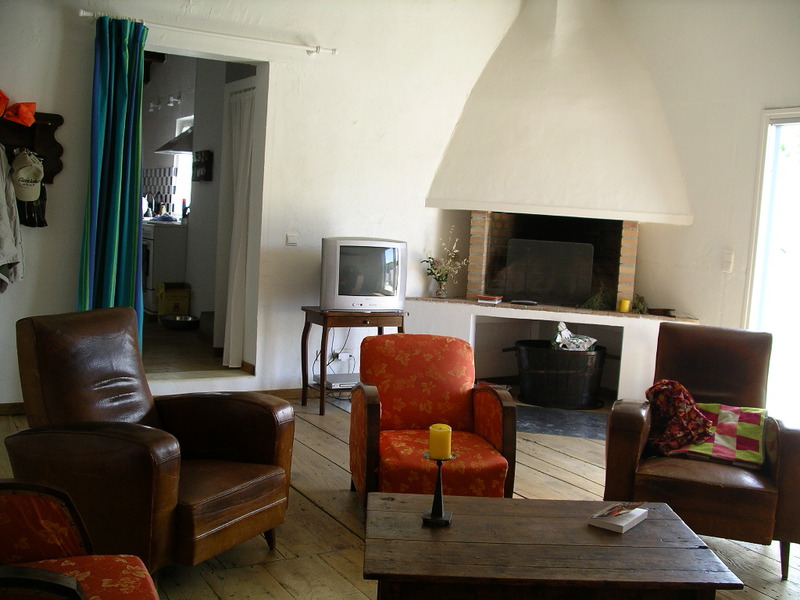 self catering), plus two independant gîtes to rent (one for 4 people and one for 12 people) which gives a choice, depending on what is required. 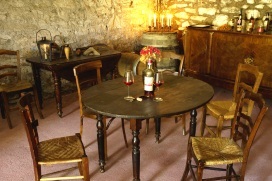 All has been given ‘Pays Cathare’ recognition within the field of rural accommodation for the quality of the welcome given and also the label ‘Sejours en Vignobles’ (a wine holiday – or break -) by Gîtes de France which is awarded to vine growing proprietors who wish to share their love and knowledge of wine with their guests. 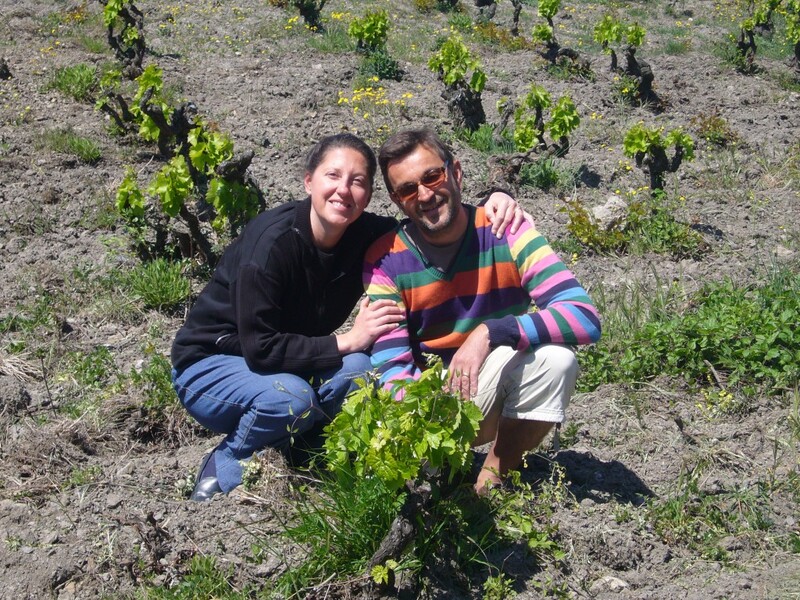 The Domaine Grand Guilhem is also a member of ‘L’Association du Tourisme Vigneron Corbières-Méditerranée’ the aim of which is to promote tourism within the Corbières and Fitou areas. Thirty three people can be accommodated and we could answer all your wishes. There are 12 hectares of vines planted on the slopes and all are ‘Appellation d’Origine Controllée’ (AOC Fitou, Corbières, Rivesaltes and Muscat de Rivesaltes), and we grow our fine vines organically. The large garden is planted with Provençal Cypresses, Alep Pines, and Palms and has a swimming pool. There is a special wine tasting room where you can sample the wines of the Domaine. In the small gîte, (given the Occitan name L’Estiu – The Summer) there is an outside jacuzzi and in the larger gîte there is another private swimming pool heated by solar panels. After sampling the wine of the Domain (photo of the wine-tasting place below) it is pleasant to wander round the small streets of the village and enjoy a meal under the open sky at “Le Clos de Cascastel” a good quality restaurant (1 folk Michelin) run by Koen & Ria de Koninck. The menus are between 14 euros and 33 euros. 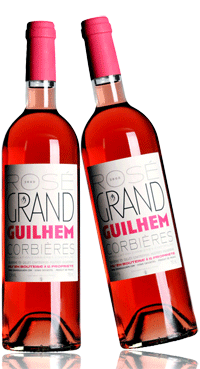 There are evenings of music and wine and special evenings called “Les Accords Parfaits du Grand Guilhem” when a wine is matched to a particular piece of music. Week long courses have been organised devoted to learning about growing vines and the mystery of wine making and there are also shorter weekend courses on wine and wine production. Both of these include wine tasting and good meals.